These exercises lay the foundation of a Montessori classroom. These are everyday life skills that children learn in order to function in society. These activities satisfy the need for imitation, repetition, and help develop coordination. They enable children to expand their attention span and develop concentration essential for all academic learning to manifest. Independence, self-confidence, body consciousness, and self-awareness develop steadily through the use of materials for: caring for oneself and the environment, social skills of grace and courtesy, and control and refinement of movement. Carrying exercises, stringing beads, sorting, pouring, scooping, opening and closing. Dressing frames: button, zipper, snap, buckle, laces, hook & eye, and bow. Hand washing and grooming. Polishing, table setting, flower arranging, dusting, sweeping, care of plants, cloth washing, lunch clean up, use of bathroom, care of classroom, care of animals, and food preparation. This allows for enrichment of vocabulary, phonetic and non-phonetic sound recognition and assimilation, function of words, and complete reading and writing. These basic skills are acquired through the use of materials in three-dimensional forms. Once these skills are mastered, the child is ready for interpretive reading and creative writing. Compound words, singular/plural, prefixes, suffixes, homograph, homophones. Introduction to hierarchies, golden beads quantity, symbols (units, tens, hundreds, thousands), decimal system layout (1-1000), formation of number 1-9,999, addition, subtraction, division, long division, multiplication, word problems. Use of Addition charts, subtraction charts, multiplication charts, division charts to master facts. Memorization of addition, multiplication, subtraction, and division tables. Small bead frame: notation, + - x / , hierarchy. Using mathematical concepts to solve problems. All the faculties of intelligence are developed through exploration of the various materials of varying dimension, color, shape, texture, smell, and taste. The special materials are organized for developing and refining each sense while isolated from the other senses, thus enabling the utmost refinement. These are essential for the ability to discriminate differences, similarities and identities, and for enhancing the memory, the imagination and consequently the appreciation and interpretation of the fine arts. Geography, Botany, Zoology, Art, and Music expose children to the world and enable them to appreciate the importance and the beauty of nature, the diversity of people and their cultures. Periods, artists, creative expression, art mediums. Periods and its composers, musical instruments, bells, movement. Days of the week, month, land and water forms, solar system, earth: (layers, globe, hemispheres, continents, oceans, zones), maps: world, USA, North America, South America, Asia, Africa, Antarctica, Australia), parts of a flag. Study of plants, life cycles, parts and functions. Gardening. Awareness of civic sense, community helpers, conservation, recycling. The Stamp Game is a concrete way for a young child to understand the process of Addition, Multiplication, Subtraction, and Division. 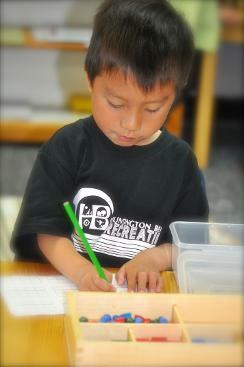 Children are able to add, multiply, subtract, divide 2 or more digits.